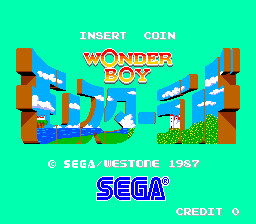 Wonder Boy in Monster Land, originally released as Wonder Boy: Monster Land (ワンダーボーイ モンスターランド) in Japan, is the direct sequel to Wonder Boy. Developed by Westone and published by Sega for Sega System 2 hardware, the game ditches the left-to-right platforming gameplay of its predecessor in favour of a platform-RPG hybrid gameplay style. The original arcade version was only released in Japan, though was planned for an overseas release. You play as Wonder Boy as he explores various short levels filled with respawning enemies. The control panel has two buttons: one to attack (with a sword you get in the first building you visit) and one to jump. enters buildings. At the end of each level, you have to enter a building to fight a boss, whose defeat will unlock the exit. There is a timer on the bottom left of the screen; if it runs out, you lose a heart. Run out of hearts and you lose the game. You gain full health after clearing a level. Main article: Wonder Boy in Monster Land/Achievements. In Japan's 1987 Gamest Awards, it came eighth place in the "Best Ending" award category. Wonder Boy in Monster Land was later ported to the Sega Master System and released to all regions. In Japan, this port is known as Super Wonder Boy in Monster World (スーパーワンダーボーイ モンスターワールド), beginning the Monster World naming trend that would eventually replace Wonder Boy as the series's name in Japan. In Brazil, the game was renamed Mônica no Castelo do Dragão, with characters being taken from the Brazilian comic series Turma da Mônica, also starting a trend of renaming Wonder Boy releases to tie into the show. The game saw the most success on the Sega Master System, though it was also brought to the Amiga, Atari ST, Commodore 64, TurboGrafx-16, and ZX Spectrum by Activision as Super Wonder Boy. When Hudson brought the game to PC Engine in Japan, the game was renamed Bikkuriman World and replaced some of the characters with others from a then popular sticker collection, which had just been turned into an anime. An MSX version was planned for release in 1988/1989, but despite being previewed in the Japanese gaming press, failed to make it to market. The Master System version has been included as part of the Wii's Virtual Console service. The arcade version was released as part of Sega Vintage Collection: Monster World. Both versions were released in Sega Ages 2500 Series Vol. 29: Monster World Complete Collection. The game was followed by Wonder Boy III: Monster Lair, a scrolling shoot-'em-up with features from both Wonder Boy and Wonder Boy in Monster Land. The true sequel is considered to be Wonder Boy III: The Dragon's Trap, which brings back the gameplay first seen in this game. In 2008, game designer Hideki Kamiya listed Wonder Boy in Monster Land among his favorite games, citing it as one of the games that influenced his work. NMK released a very similar game for the Nintendo Entertainment System as Saiyuuki World (西遊記ワールド). Saiyuuki World shares very similar gameplay, but is retooled to resemble the Chinese novel Journey to the West. 1987 Sega /Westone. All Rights Reserved. TM & (C) Sega/Westone 1987. C64 Version By: Images Design. Main article: Wonder Boy in Monster Land/Magazine articles. NEC Retro has more information related to Bikkuriman World.